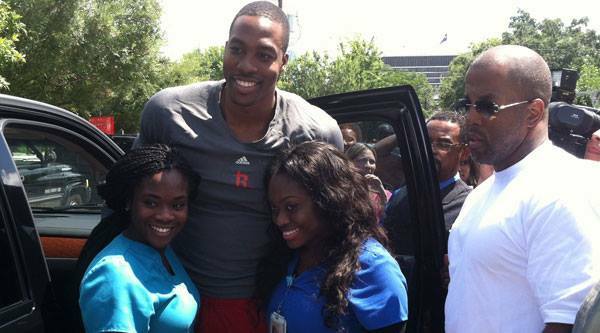 Dwight Howard is already ingratiating himself to the fans in Houston. Homie purchased lunch for everyone at the Breakfast Klub in Houston yesterday afternoon and took pictures with fans. Dwight Howard isn’t a technical member of the Houston Rockets yet. He can pose for Twitter avatars in Houston gear all he wants, but he’s yet to sign pen to paper on his four-year, $88 million contract, as per NBA rules. Dwight’s had a pair of NBA contracts before this though, including one max deal, so he’s well-heeled enough to pick up a few tabs. Or the tabs of an entire restaurant full of breakfast diners, as was apparently the case at The Breakfast Klub in Houston on Tuesday morning. ClutchFans.net hepped us to the news, which I guess is news, that Dwight ingratiated himself toHouston by buying a few breakfasts after dining on catfish and grits. We’re probably more envious of Dwight’s breakfast than we are his four-year, $88 million contract.